A late Thanksgiving treat for all of you Chronicles of Narnia fans, if there are any left after Prince Caspian. Over on the official Facebook page for the Narnia movies, three new photos have been released. We posted some spy photos of the ship in The Chronicles of Narnia: The Voyage of the Dawn Treader back in August, but these are the first three official photos and they all look pretty damn cool. Though I'm already getting reminded of Pirates of the Caribbean and I imagine once we see a trailer for this, it'll look a lot more like the Pirates movies. Apparently most of the story takes place on this ship, as seen below. Check ’em out! Seen at the top is the helm of the Dawn Treader. 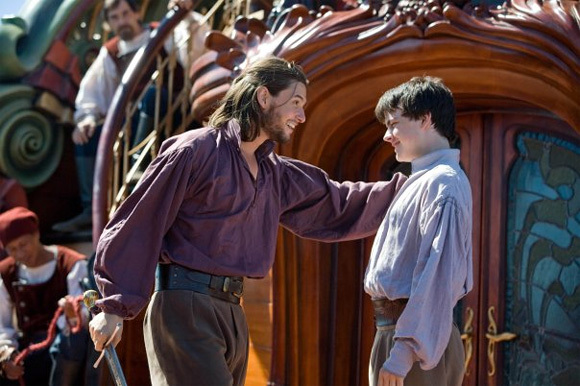 Below is Ben Barnes as King Caspian and Skandar Keynes as Edmund Pevensie. 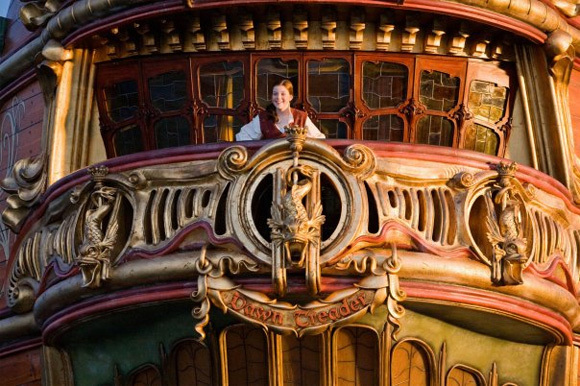 And beneath that is Georgie Henley as Lucy Pevensie on the Dawn Treader as well. I remember reading these when I was a kid and theres never been a better book to film adaptation than prince caspian IMO sso looking forward to this. Not really sure why these movies didn't perform better in theaters...I thought that they were both pretty darn good. I actually didn't even know Dawn Treader was being made, so I am really excited now. Weren't the films laced with a christian edge? And funded by someone quite jesusy too? That would put me off going to see a film knowing that. I read this book, and the second and third acts will be worth the admission price to see on film. A lot of trippy stuff happens. This is going to be great. #5 - the books were all written by one of the most famous Christian authors of the modern era, C.S. Lewis. For those of you who can handle that, the Dawn Treader is arguably the best of the series. But seeing how they mangled Caspian, I'm a little hesitant about this one. Oh they are making this film! yay! Of the series, I remember liking this book more than most. It should prove to be good, and hopefully it will perform well at the box office. My favorite was The Horse and His Boy. I hated this book because we had to say goodbye to my favorite character in the series. Still, this is looking to be a great film. Amazing shot of Ben and Skandar! Thanks for the photos, I can't wait to see the movie, shame that we have to wait another year!! Oh well, anything worth while is worth waiting for. stupid british bastards with their nasty foreskin! Good to have this franchise back. I am realy exsited to see this third film of Narina!!!! My favorit book in the series and a lot of adventurs that I'm looking forword too seeing in it. I hope they do better in this movie then they did in Prince Caspian. Don't get me wrong!!! I liked prince Caspian, but I think they will do a very good job if they realy fallow the book. C.S.Lewis is my favorit Athour in the classics that I have read in my life. #5 all of the Chronicles of Narnia books and movies are great. If you are "put off" by the content then don't go see it. Just stick with your Borat garbage. By reading some of your other posts, I see how fitting your post name is for you.